Hollister Restore Silver Non-Adhesive Foam Wound Dressing promotes healing of wounds with moderate to heavy discharge. It has a vertical absorption, reducing leaks and keeping all discharge together deep within the dressing. The foam dressing has no adhesive and will require a secondary dressing or tape in order to keep it in place. The semi-permeable backing of the dressing allows air in while not allowing the wound discharge to pass through. This protects the skin surrounding the wound as well by allowing it to breathe and preventing maceration or breakdown of the skin. 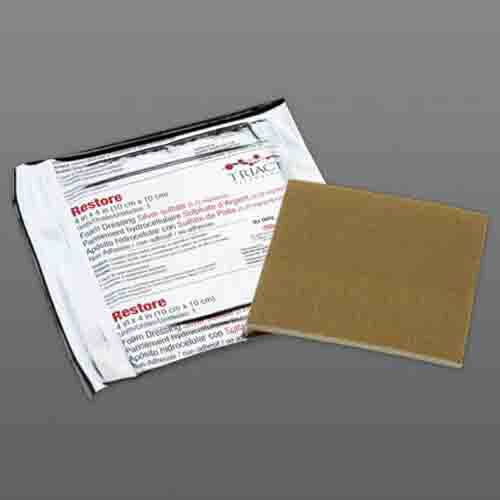 The Hollister 509345 Restore 4 x 4 inch Non-Adhesive Foam Dressing and the Hollister 509346 Restore 6 x 8 inch Non-Adhesive Foam Dressing both come fully sterile and individually packaged. This helps to reduce the risk of infection. The foam dressing also reduces infection by protecting users from harmful bacteria entering the wound. The antimicrobial silver infused into the dressing prevents growth of harmful bacteria that may be present in the wound as well. This helps not only to prevent infection, but promotes a faster healing time. Hollister’s Triact Techonology contained in the Restore Dressing creates a lipido-colloid gel along the surface of the wound. Not only does this provide a healing, moist environment for the wound, but it also helps prevent ripping or damage to the skin during dressing changes. This makes dressing changes more pain free and simple. It further protects the skin by being latex free, reducing the chance for allergic reactions and allowing it to be used by more people.